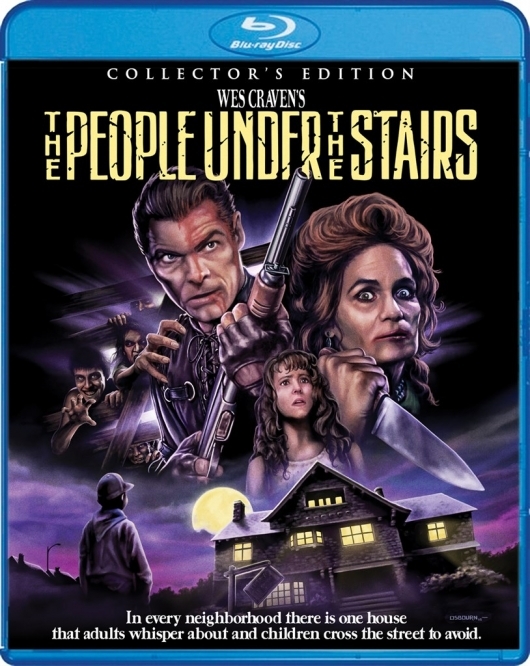 The People Under the Stairs comes to Blu-ray thanks to Scream Factory, Shout Factory’s sub-division of forgotten horror and science-fiction films. As with most Scream Factory releases, this Collector’s Edition of the movie looks great, with healthy grain retention and full colors. With a 1080p transfer in 1.85:1 and a DTS-HD Master Audio 2.0, as well as a DTS-HD Master Audio 5.1 mix for home theater enthusiasts, Craven’s classic is getting the treatment it deserves. There’s plenty of special features too, including two commentary tracks, behind-the-scenes footage, and interviews with Wendy Robie, director of photography Sandi Sissel, composer Don Peake, and special make-up effects artists Greg Nicotero, Howard Berger, and Robert Kurtzman. On the first commentary track, moderator Michael Felsher and Wes discuss the film’s themes and how it’s – sadly – just as relevant as ever in 2015. I was seven years old when The People Under the Stairs opened in theaters. The idea of mutilated, cannibalistic children living in the walls of a dungeon-like home occupied by a leather-studded psycho was horrifying, and yet I was compelled to know more. Every time a TV spot came on, I would watch through my fingers hoping to see something so shocking that it’d keep me up at night. Craven’s films, regardless of critical or commercial success, possess a kind of power – a dark, primordial energy that arrests the viewer and awakens our deepest fears. The People Under the Stairs is a horror-thriller with darkly comedic undertones that packs more thematic punch than 90% of today’s horror releases. As time goes by, Craven’s film only becomes more powerful (and relevant). Time has been kind to this film, and Scream Factory’s top-notch high-definition release only highlights how much of a gem it really is. Scream Factory’s The People Under the Stairs (Collector’s Edition) Blu-ray is now available at Amazon. Check out the full list of bonus features, trailer, and cover art below!